Enter your email address or product code, and we will email your password to you. 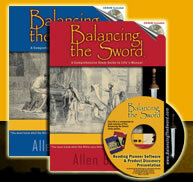 If your email address on record with us is no longer valid, send us an email at Grow@BalancingTheSword.com including your 12-character product code. Your 12-character product code should be found on the inside of the back cover of the red book (Vol. 1) or on your old CD sleeve (for purchases prior to 2010). Perfect for family Bible studies, etc.